I am reading Adam Grant’s amazing book, Give and Take, for the second time, and the topic of teacher burnout made me write this post. As a school administrator, I meet with teachers all the time who are feeling frustrated and on the verge of just giving up. I also have known teachers who would be identified as the classic burned out teacher. I wish I could say that all the teachers on my staff come to work every day happy and enthusiastic, giving their best effort in the classroom, but of course, I can’t, and this bothers me. I want my teachers to shine and keep shining. Our kids need our teachers to keep shining. I believe it’s the school administrator’s responsibility to keep teacher burnout from infecting his/her school. So, what causes teacher burnout? I always thought it was the constant demands placed on our teachers and the lack of support from parents, colleagues and yes, school administrators. What I learned from Adam’s book, however, really got me thinking. Teachers, as with all kinds of “givers,” need to see the fruits of their labor in order to keep their enthusiasm and energy high. You know this is true. I used to love it when former students would come back to see me. Why is that? It’s because I was able to actually see one of those “fruits of my labor.” It had an energizing effect to see a successful high school student or college graduate who had spent a year in my class. So how does Adam Grant’s research help me to keep my teachers from burning out? I need to be the one to remind them on a constant basis that their work matters. Mrs. Smith may not ever see Johnny again after he leaves her class at the end of the year. You know Johnny. He’s the one that Mrs. Smith spent hours helping after school, investing her time and energy, so he would be able to graduate. He’s the one that Mrs. Smith spent her own money on, so he could go on the class trip. At the end of the year, Johnny’s gone, and Mrs. Smith is hoping that her efforts with Johnny mattered. According to Adam Grant, Mrs. Smith is susceptible to burning out, because she’s such a giver. If Mrs. Smith doesn’t see that her efforts are having an impact, her light might just dim as the years go on. I’ve been in education a long time, and I’ve actually seen this happen. It’s sad to see so many teachers begin to lose their enthusiasm for teaching. 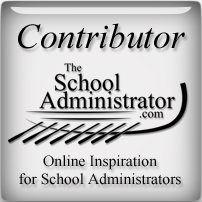 What can I do as the school administrator? What if I could find Johnny, and have him come back for a visit, or even write a letter to Mrs. Smith? I think that would brighten Mrs. Smith’s light again. Right? What if I could have Johnny record a video for Mrs. Smith from his college campus, thanking her for her efforts. Wouldn’t that be awesome? 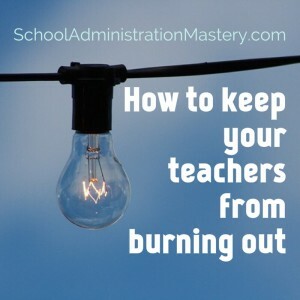 As a school administrator, can you identify teachers on your staff who are beginning to burn out? With Adam Grant’s research in hand, I’m am going to begin to look for ways to show my teachers that their work matters. The effort and time that they invest in their students is valuable, and I am going to remind my teachers of this. I cannot sit back and allow my teachers to burn out. It would be irresponsible for me to do so. Now that I understand the cause of teacher burnout, I am better prepared to address it as the school administrator. If you haven’t read Give and Take by Adam Grant, I believe it’s a must read for anybody in educational leadership.